Anshan — Pan-Asian premium Tier VI destroyer. One of the Soviet destroyers built under Project 7 (the Gnevny class). She had a high speed and powerful artillery. The ship was handed over to the Navy of the People's Republic of China in 1955. By that time, her AA defenses had been noticeably enhanced. Anshan is now preserved as a military museum ship in Qingdao, China. She was first released for sale on 8 February 2016 for the NA server and 12 February 2016 for the EU server. Essentially a Tier VI Gremyashchy flying a Pan-Asian flag, Anshan is surprisingly more sluggish than her Russian counterpart but has better torpedoes. She's better suited for second line skirmishing than going all-in on close-range combat with other destroyers, as her turrets turn a bit slower than the American destroyers she will encounter and are easy to incapacitate or knock out if under heavy enemy fire. She can take a bit more punishment than her peers and her concealment is reasonable enough to perform torpedo attacks without getting detected. Premium camouflage gives 100% bonus to Free experience which makes Anshan ideal for Free experience farming. Torpedo speed of 60 knots with an 8.0 km range is slightly better than Gremyashchy’s 55 knots at 8.0 km and vastly outranges Gnevny’s choices. Capable of carrying out torpedo attacks without being detected by her target. Improved uniform AA defense in the form of four dual 37mm mounts. HE shells have a 7% fire chance (2% worse than Gremyashchy and 1% worse than Podvoisky). Has exact same torpedo set up as Gremyashchy but with slower reload time, 0.8 rounds/min instead of 0.9 rounds/min. Essentially a Tier VI Gremyashchy with slightly worse overall offensive power, concealment, and flat out worse maneuverability. Turret traverse speed is not ideal for close-range fighting even with Expert Marksman. As a premium ship, Anshan doesn't have any upgrades to research. Skill points on Anshan commanders should be focused on maximizing the usefulness of her main battery and improving her survivability. The latter is best accomplished by attempting to preserve her engine functionality (Last Stand) and health pool (Survivability Expert); however, there are other useful skills at those levels as well, such as Expert Marksman and Advanced Firing Training. Captains will have to use their judgment to decide which is best for their play style. Keeping Anshan’s engine in working order is paramount to her survival; captains are strongly recommended to spend the credits (or doubloons) on Damage Control Party II ( ) for the reduced cooldown on repairs. 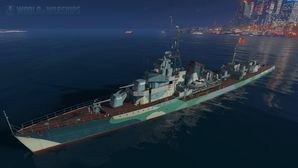 As a premium ship, Anshan comes included with Type 11 camouflage that is unique to her. It lowers her detection radius, reduces the accuracy of incoming shells, increases the amount of experience she earns, and provides an additional bonus to the Free experience earned in battle. Anshan following her late 1960's refit that replaced both sets of torpedo tubes with anti-ship cruise missiles. The starting point in the creation of destroyers of Project 7 was the creation of a Tactical-Technical Requirement (abbreviated in Russian as "TTZ") for the design of a destroyer to replace the obsolete Novik class ships. This TTZ was reviewed by the Technical Administration of the Red Army Navy in October 1929. Initially, the appearance and elements of the new destroyer were very much like Novik: displacement of 1,300 tons, 100mm main battery guns, with speed increased to 40 knots and the torpedo caliber upsized to 533mm (instead of the previous 450mm). Design studies for the new destroyer line lasted for more than three years. There were many disagreements at different administrative levels throughout the design process, due partly to the views of Soviet leadership on the role of the Red fleet and the general development of naval equipment. The chief concern of the project from the very beginning was the conflicting requirements for the new ship: on the one hand, they had to be small and cost-effective to build; on the other hand, they must also be state-of-the-art when compared to foreign navies. In addition, many personnel responsible for the project came to the conclusion that without the input of advanced foreign experience the Soviet Navy was unlikely to quickly develop a destroyer design fit for large-scale construction. In the summer of 1932, a delegation of representatives from the Soviet Navy traveled to Italy. There, their attention was focused on two very advanced Italian destroyer designs: Folgore and Maestrale. It was Maestrale that eventually inspired the design of the Gnevny-class destroyers. Italian firm Ansaldo accepted an offer of cooperation, since Italy was (at that time) an important military-political ally of the Soviet Union. Ansaldo provided a great deal of technical documentation, as well as allowed Soviet design engineers to study the technology of building ships at their shipyards. In October 1932, the Revolutionary Military Council approved the design concept of a destroyer with a standard displacement of 1,300 tons, in which the characteristics of future destroyers of Project 7 were already visible: armament of four 130mm and three 76mm guns, two triple-tube 533 mm torpedo launchers, a maximum speed of 40-42 knots, and an operational range of 360 nautical miles at full speed (or 1,800 nautical miles at a much lower cruising speed). The Gnevny class would also displace less than Folgore or Maestrale, though the Soviet destroyer would exceed the armament and speed of its Italian brethren. The design of the Gnevny class was included in the large Soviet naval shipbuilding program for 1933-1938. Funding was approved on 11 July 1933 by the Council of Labor and Defense; it provided for the construction of 1,493 combat and auxiliary ships, including 8 cruisers and 50 destroyers. Soviet designers borrowed the layout of the engine and boiler plant from Maestrale, as well as the general architecture of the ship; however, the domestically-supplied armament, machinery, and equipment, forced some significant departures from the Italian designs. Consequently, the influence of the Italian designs — short of providing documentation — was limited to the development of a theoretical blueprint (provided by Ansaldo) and the run of the model in the experimental basin in Rome. The ultimate design of the destroyer, which received the name "Project No. 7", was approved by the Council of Labor and Defense in December 1934. The final technical characteristics of the project were a displacement of 1,425 tons, a top speed 38 knots, main armament of four 130mm guns, two 76mm anti-aircraft guns and two three-tube 533mm torpedo launchers, and a crew of 170 sailors. At that time, most of the equipment and weapons for the new project did not exist even on paper, and their weights and dimensions were only estimates. Moreover, there was no contingency built into the displacement calculations for the project, leaving a great deal of risk in the final weight and stability of the class. The ship that would eventually become Anshan was laid down on 25 September 1936 at the A. Marti plant (No. 198) in Nikolayev, Ukraine, under the construction number S-327 and the name Pryktyk. Her sections were later transported to the Far East by and on 15 August 1938, she was re-laid at Dalzavod in Vladivostok. Launched on 6 April 1940, she was officially re-named Rekordny (Russian: Рекордный) on 25 September 1940. Rekordny joined the Pacific Fleet on 9 January 1941. In August 1945, she was a part of the 1st Battalion of destroyers of the light forces of the Pacific Fleet. She did not take an active part in hostilities against Japan, guarded internal communications, accompanied transports, or was on alert in port, ready for deployment. From 20 October 1949 to 17 December 1952, major repairs and upgrades were carried out at Dalzavod, with the installation of new radar stations, the tripod of the foremast and the replacement of part of the armament. On 22 April 1952, the PLA commander, Army General Xiao Jinguan arrived in Moscow to negotiate the purchase of combat ships (destroyers), coastal artillery, aircraft, mine and torpedo armament and various training simulators for the Chinese fleet. The Soviet Union initially refused to sell destroyers and a number of other models of military equipment, and for other equipment requested a much larger amount than was typically asked for in the international arms market. To advance the negotiations, Mao Zedong spoke twice on the phone with Stalin, explaining the importance of "Soviet-Chinese strategic cooperation," and urging him to sell destroyers. From September 1952 through early 1953, Luo Shunchu, deputy commander of the Chinese Navy, visited the Soviet Union twice to lead an agreement on the sale of destroyers for the Chinese fleet. Negotiations were difficult. On 12 March 1953, Luo Shunchu cabled the Chinese Premier Zhou Enlai that "the Soviet Union not only sells us garbage, but also asks an unreasonably high price for it." On 16 March, Xiao Jinguan also referred the ships proposed by the Soviet Union as "scrap metal" in a telegram. Ultimately, the sales agreement was signed on 4 June 1953. According to the documents, the Soviet Union assumed the obligation to transfer naval equipment and technologies for building warships and auxiliary fleet ships in China, as well as providing technical assistance in the form of sending specialists. Part of this agreement was also the acquisition of four destroyers of Project 7, four submarines, as well as other ships and boats of a smaller displacement. The Soviet Union also provided materials and equipment necessary for the construction of shipyards and ships in China. A detachment of ships of the Pacific Fleet of the Soviet Union consisting of two destroyers, two minesweepers and two submarines left Vladivostok for Qingdao on 13 October 1954. The next day, Chinese crews were put on the ships for training. During the transition, the Chinese crews on the destroyers trained on the various operational systems, including communication, fire control, and studied torpedo and mine weapons. They were also given the opportunity to conduct training artillery firing, which was not originally part of the agreed training program. The first two destroyers of Project 7 arrived in Qingdao on 25 October and moored at berth No. 3. The next day, the ships were named Anshan and Fushun and formed into the first division of destroyers of the PLAN. The ships initially received the aircraft numbers "101" and "102" respectively. Rekordny was officially struck from the list of the Soviet Navy and transferred to the People's Republic of China on 6 July 1955. Anshan was named after the industrial city of Anshan in the province of Liaoning. During the 38 years she served the PLAN, she was visited by nine foreign dignitaries as well as two Chinese leaders: Zhou Enlai and Deng Xiaoping. She was decommissioned in April 1992 and is anchored at the Naval Museum at Qingdao. Anshan as a museum ship at the Qingdao Naval Museum. This page was last modified on 24 April 2018, at 22:17.